Control over cash receipts and disbursement are a vital element of the company's internal accounting controls. 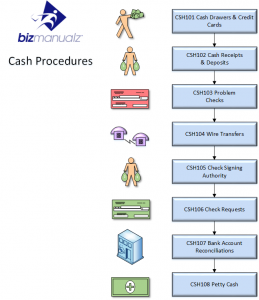 What Cash Cycle Procedures should you use? Cash Management is a critical part of small and medium-sized businesses that rely on a steady, consistent stream of incoming cash — customers paying for goods and services with cash, checks, and credit cards. Many retail and service businesses have multiple people conducting cash transactions throughout the day. Creating a cash management policy for important cash handling processes like cash drawer management, end of day closing, or cash in deposits, is vital to protecting the life blood of your business. Sloppy approaches to cash management can lead to temptation. Employees handling a significant amount of cash carry the greatest opportunity for fraud or abuse. 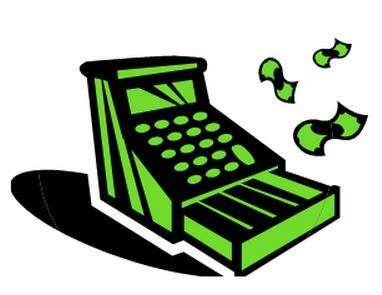 Cash handling procedures are used to minimize cash handling risks. Multiple cash counts by different people make the basis of sound cash internal controls. For example, the same person who handles the money should not be the one accounting for it. Cash funds should be counted often and by at least two people. Different people should handle cash, checks and deposits from those who record them in the books. Cash handling procedures are one area auditors examine. Poor cash management policies and lack of control over cash handling will certainly make a poor impression, and possibly even impact an auditor’s perception of your accounting practices. Good controls using cash policies and procedures that are clearly communicated and regularly audited internally indicate to external auditors that cash controls are working. Not only do proper cash policies and useful cash procedures send a clear signal to auditors, it also creates the required operating environment for employees. Due diligence and transparency involving regular management activity (including creating and updating cash policy and procedures) sets a tone that professionalism is the standard. Mistakes that are quickly caught and corrected convey a clear message about the importance of proper cash management. Understanding key elements of your business, setting the proper environment for employees, creating a positive impression for auditors; these are just some examples of how proper cash policies and procedures can help your business. If you don’t feel you have the proper cash management controls in place, it is never too late to start. Begin by understanding your cash processes and identify what is important and what risks you face. Address them by creating cash procedures that incorporates data collection and review as well as the typical controls such as second person reconciliation. If your business relies on cash flow, as most do, why would you leave cash management to chance? Adequate control over all cash receipts and disbursement are a vital element of the company’s internal accounting controls. Cash Cycle Procedures should be utilized to control the flow of cash through your company and should be clearly defined within your accounting manual. Proper internal control should be maintained over funds received by cashiers or sales clerks at all times. The company should identify cash procedures for cash drawer control, including cash receipts, credit cards, special tender items, cash payouts and reconciliation with deposits. The company should establish the methods to be followed for receiving, applying and depositing cash receipts. The Cash Receipts Procedure applies to all cash receipts received by the company. Accurate internal control of cash receipts and deposits should be maintained at all times. For example, Cash deposits should be made on the same day as receipt. The company should define a problem checks procedure to describe how difficult to cash checks are handled before depositing, in order to save time in returning and following-up on unsigned checks, checks marked “payment in full”, or those returned by the bank. This applies to all checks received by the company. The company should provide additional payment options to customers and vendors in order to make funds immediately available to the receiving party. Wire transfers should be treated with special care and accuracy to prevent loss to the company or the customer. The company should explain the steps necessary to ensure proper wire transfer procedures are followed when processing wire transfer requests. This applies to customers who are sending or receiving wire transfers and the financial institutions, which process these requests. The company should outline “dollar limits”, the check signing authority process, and limit the number of employees authorized to sign checks, while ensuring that there should be no fewer than three individuals at all times. While a hired accountant, office manager, or accounting clerk may be responsible for entering bills, paying bills, and printing out checks, all printed checks and related documentation should be presented to a second individual for signing. No one person or employee (other than perhaps the owner) should be allowed to enter invoices, select invoices for payment, then print and sign checks. At a minimum, this process requires at least two individuals to ensure the integrity of the accounting system remains intact. This applies to all regular bank checking accounts of the company. The company should describe the process for completing a check request form to ensure the efficient processing and record keeping of all manual check requests. The company should outline the practices for preparation of a monthly bank reconciliation and ensure the accuracy of the company’s bank account records by proving the monthly balance shown in the bank’s Account Register. This applies to all bank accounts maintained by the company. The Petty Cash Procedure helps outline the disbursement and reimbursement of petty cash. To facilitate minor business expenses, a petty cash fund will be available to employees. This procedure applies to all employees of the company. The authorization or accuracy of cash receipts, the failure to record cash receipts or withholding or delaying the recording of cash receipts. Covering unauthorized transactions by substituting unsupported credits or fictitious expenditures to cover misappropriated collections; under or over estimating cash or receivables. Misstating cash balances; covering unauthorized transactions by falsifying bank reconciliation. All cash collections must be properly identified, control totals developed, and collections promptly deposited to limit risks associated with recording cash receipts or withholding or delaying the recording of cash receipts. All transactions should be promptly and accurately recorded in sufficient detail on proper accounting records and appropriate reports issued to prevent unauthorized transaction substitution with unsupported credits or fictitious expenditures. All transactions are properly accumulated, classified and summarized in the general ledger; balances are correctly reconciled with bank statement balances in a timely manner to prevent cash balance misstatement or the offsetting of unauthorized transactions. How Safe are Your Cash Receipts? Cash Cycle Procedures are an important element of internal control to ensure that your company’s income statement is accurate. If your primary source of operational cash flow is from cash sales then your cash needs to be protected, managed and monitored using industry best practices for financial internal controls. Download Free Sample Accounting Procedure Templates to see how easy it is to edit MS Word Templates to build your own accounting policy and procedure management system.